Description: Freedom Day, January 22, 1964, Hattiesburg (Miss.). Organizers, participants and onlookers outside Sears Roebuck store across Main Street from the Forrest County courthouse in morning. 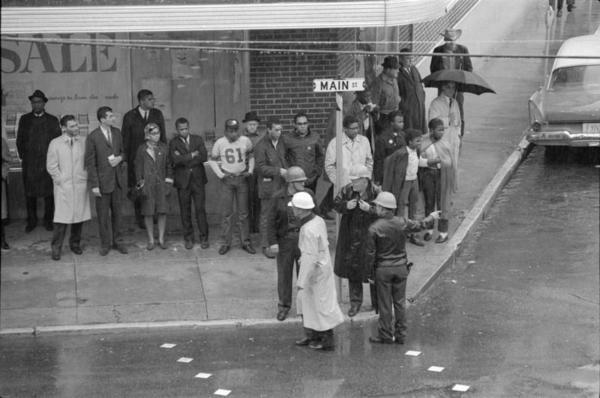 Group includes: James Forman, black male in pale trench coat behind street sign; Bob Moses, black male in glasses to immediate left of Forman; John Lewis, black male in suit to immediate right of female; Howard Zinn, white male in suit.